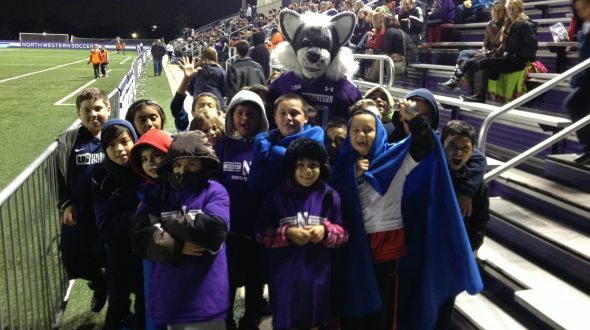 Students and families from Jahn World Language Academy experienced the life of a college student athlete on Thursday October 17th while attending the Northwestern girls soccer game. Arriving at 5:30 to warm up before the game, Jahn students, parents, and siblings, walked by the lakeside campus of Northwestern and participated in a pre-game parents vs. student game next to the Wildcats soccer stadium. Jahn parents Nicole Brokar and Kelly Ray saved goals, passed the ball, and even made a few headers while competing against their daughters. Thank you Heather, Katie and the Northwestern Athletics Team for giving Urban Initiatives students an opportunity to see, engage with and celebrate Northwestern soccer. Thanks Coach Guerra and the Jahn families for having fun. Go Wild Cats!